There are many excellent reasons to attend a writers’ conference, including the possibility of meeting famous people and big name writers. Some conferences bill these bestselling authors as Guest of Honor, as Harlan Coben is for next year’s Bouchercon in New Orleans. ThrillerFest identifies their special honoree as Thriller Master, and have given that honorific to Nelson DeMille this year and Heather Graham next year. 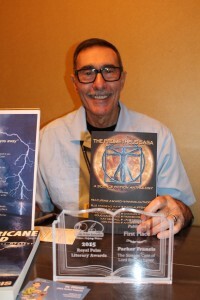 And the Florida Writers Association Conference has a Person of Renown, with Marie Bostwick filling that role this year and John Gilstrap in 2016. While every conference is a bit different, most include craft workshops, panel discussions, opportunities to pitch agents and publishers, and, of importance to all published authors, book sales through the conference bookstore and book signings. I attended two writers’ conferences in October, and came away feeling both were money well spent. What? You thought these things were free? All conferences have registration fees, but on top of that you have to figure the cost of travel and accommodations. It can be pricey depending on how far you’re traveling, but it’s all part of the cost of doing business as a writer. As I said, there are a lot of good reasons to attend a conference, but making a lot of money selling your books isn’t one of them. Book sales are usually fairly meager, unless you’re one of those nationally-known authors. No, the most common reasons to attend include improving your craft, networking with other writers, getting energized and inspired, and the possibility of making a vital connection with an agent or publisher. I’ve attended the Florida Writers Association’s annual conference for years, and this year as a fulltime volunteer on the registration desk. Since I was a finalist for a Royal Palm Literary Award, I wanted to be there to (hopefully) pick up the award in person. The good news is that my short story submission, “The Strange Case of Lord Byron’s Lover,” took 1st Place honors in its category. I later learned it had also garnered the second highest number of points from the judges of any submission in the competition. Way cool! Here I am at a signing with my award front and center. Another reason to attend was to participate in a signing of The Prometheus Saga anthology with the other authors in attendance. The collection, which included my short story, had recently been published, and we wanted to promote it to as many people as possible. It worked, as we later learned our anthology was the second highest selling fiction title in the FWA bookstore. Not too meager after all, particularly for an anthology. My next conference was Killer Nashville, an excellent conference for mystery and crime writers. The conference is held at the Omni Nashville Hotel, adjacent to the Country Music Hall of Fame and only blocks from Broadway Avenue, where dozens of honky-tonk bars line each side of the street, rocking with music night and day. And on Halloween, which was the weekend we were there, nearly every other person was in costume. 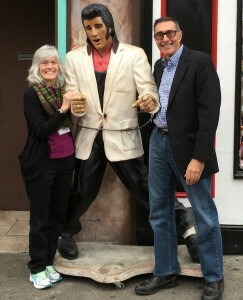 My dear wife accompanied me as she’s quite supportive, but mostly because she has family in the Nashville area and we make a point to visit with them each of the three years we’ve attended. One of the highlights of the conference was participating in a panel discussion on “Show Don’t Tell.” What made it special were my fellow panelists, all terrific writers. We gathered at The Southern Restaurant the night before our panel to get to know each other a little better. We didn’t talk much about the next day’s panel, but here we all are sitting around after dinner. From left to right are Allen Eskens and his wife, Joely, Kay Kendall, Charles Salzberg, Linda Sasscer Hill, my wife, Evanne, and yours truly. The panel went swimmingly, with lots of good questions from the audience. We celebrated later that day by visiting a few of the music establishments on Broadway Avenue. And you’ll never guess who we met there. Which proves my point that one of the reasons to attend is meeting famous people.